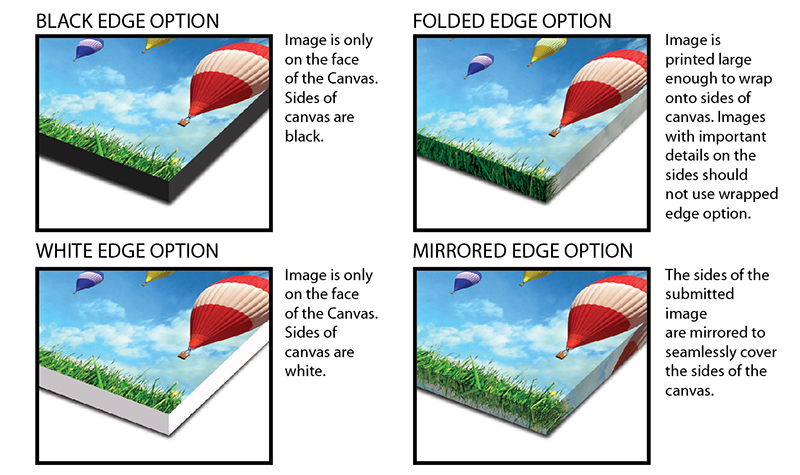 There’s no better way to add a high end feel to a photo or art print than printing on canvas. Commemorate your favorite family photos, or create replicas of original drawings and paintings in different sizes to accommodate your wall space. Custom canvas prints are a decorators dream! We are able to print on flat canvas that can later be framed, or create stretched canvas prints that can be mounted directly to the wall. 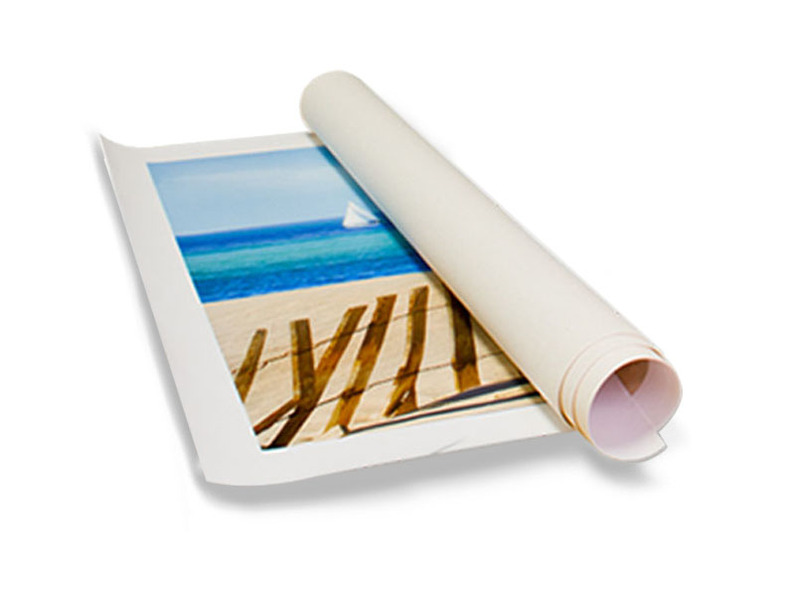 Our large format printing department can produce flat canvas up to 4′ x 8′, and stretched canvas up to 32″ x 48″! 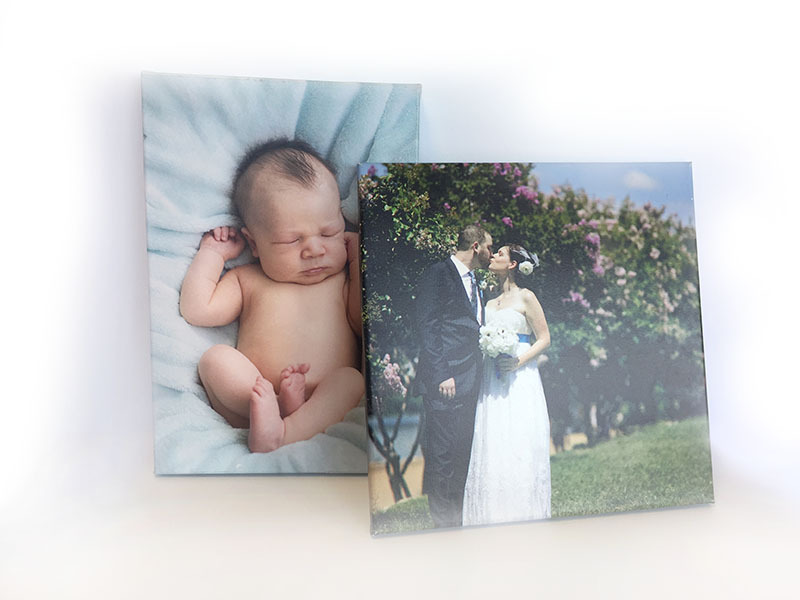 We even offer custom 3″ x 3″ mini canvases complete with display easels! 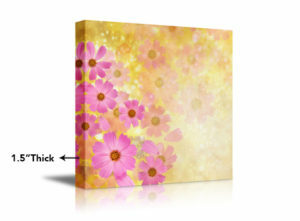 These canvases make great gifts, so order one for yourself and one for a friend! We’re an authorized FedEx Ship Center, so we can send it to anyone in the country with a special message of your choice. Contact us today to tell us your ideas for canvas prints, we’d love to get creative with you! 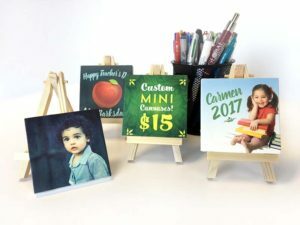 Custom mini canvas prints come with their own easel and are just $15 each! Flat Canvas is priced at $12/sq ft.
Flat Canvas can be printed and cut to any size less than 48″ x 600″. We are able to trim with white space surrounding the image to leave room for matting if desired. Please specify if you’d like white space included, and how much you’ll need when ordering. We do not provide framing and matting services here, but we’re happy to point you in the right direction! Gatorboard is a smooth and sturdy substrate ideal for showcasing photos and art. It is similar to foamcore, but instead of paper on either side of the foam, there are thin sheets of plastic. Our gatorboard is about 1/4″ thick, so it can be easily framed, or mounted directly to the wall for a more minimalist look. We can also apply matte or glossy lamination to enhance durability and provide an even more upscale presentation to your image. Gatorboard prints are about $12 per square foot, with a lamination upgrade costing just $3 per square foot. This gatorboard print has been treated with gloss lamination, which enhances saturation and contrast of the photo beneath. 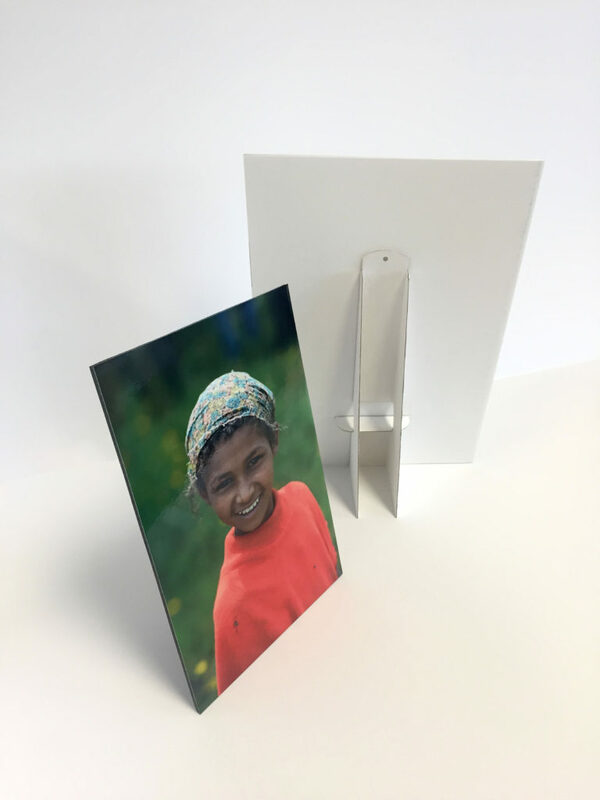 We’ve also added an inexpensive cardboard easel back, so the photo can be displayed on any flat surface. 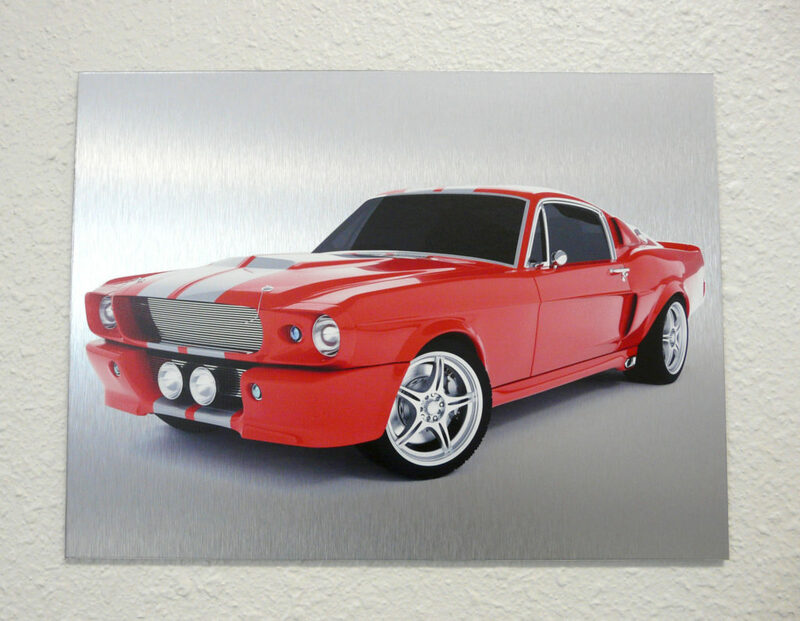 Dibond is essentally a plastic substrate, and we have it available in plain white, but this brushed aluminum version gives an extra special appearance to photos and artwork. This substrate is 3mm thick and costs $14 per square foot. 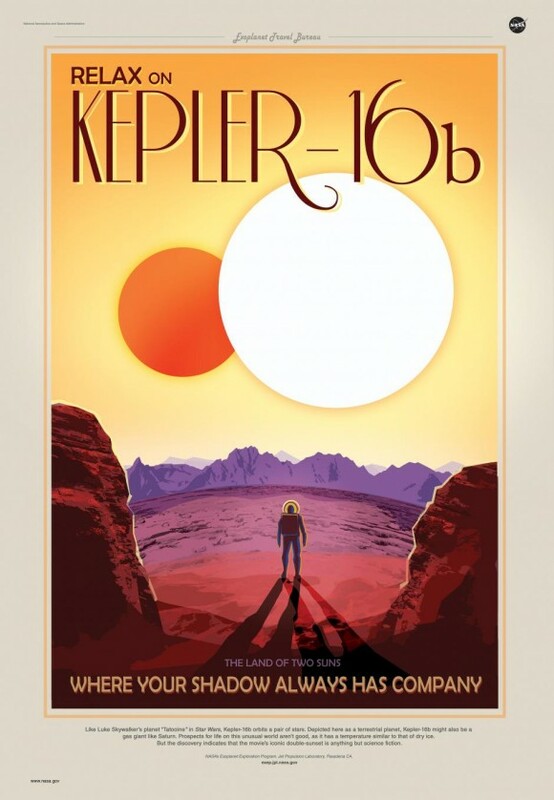 Poster paper is a reliable and affordable option, and is ideal for pieces that will be framed. We can print posters up to 4 feet wide, and length is virtually unlimited. The price of poster printing is $4 per square foot.